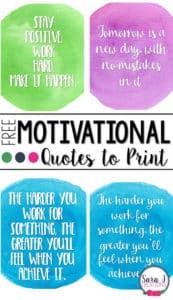 A little motivation for your students, a quote of the day, classroom decor…there are so many possibilities for these free motivational quotes. Just print the version you love best and hang it up to inspire your students. Click here to download your free quotes. Thanks so much- these are great even for the youngest of our little learners!